Good afternoon all - Well it's raining hard again and has been for the past few days so i guess it's time for waterproof shoes. 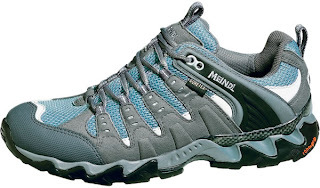 With that being the case, we have just received stock of the Meindl Respond XCR, a lovely looking shoe made to the high standards that you would expect from Meindl. With Gore-Tex to keep you dry, Contragrip sole for great grip even when it's really wet (it's the same stuff they use on Salomon trail running shoes so it has been proven over many years) and a Meindl air active footbed for immediate and long lasting comfort, This is a very comfortable and durable shoe. We've not yet had a chance to test it extensively but the fit is particularly good, with plenty of room in the toe box but with a good secure fit in the heel and instep/arch area. So it does the job performance wise and it also looks very nice too, as you can see from the pictures above and right. In fact, it's a slightly more modern look from Meindl and we think it works well. So come in and give a pair a try and see what you think.